A overlook of Fan-Shaped Train Garage, Changhua. Most of train garages in the world are rectangle. Fan-shaped train garage (or called roundhouse) spreads out like a fan. All tracks of each locomotive room extend to the center of the circle and there is a rotatable wheel with a short track on it. 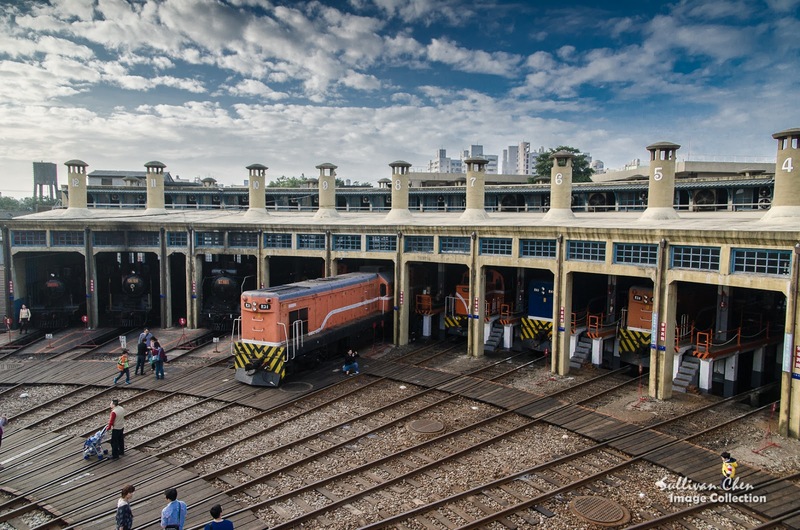 Fan-Shaped Train Garage is built to repair and park steam locomotives within limited space. Because steam locomotives could only go forward, the rotatable wheel is designed to change the direction the steam locomotive. All steam locomotives face out when parked. Since there are fewer and fewer steam locomotives, most fan-shaped train garage has dismantled or became museums. The Fan-Shaped Train Garage of Changhua Station, which is still in service now, was built in 1922 when Taiwan was colonized by Japanese Japanese built 5 fan-shaped train garages, but only the one in Changhua Railway Station is reserved. At the corner of the garage, you will find 2 unique robots. 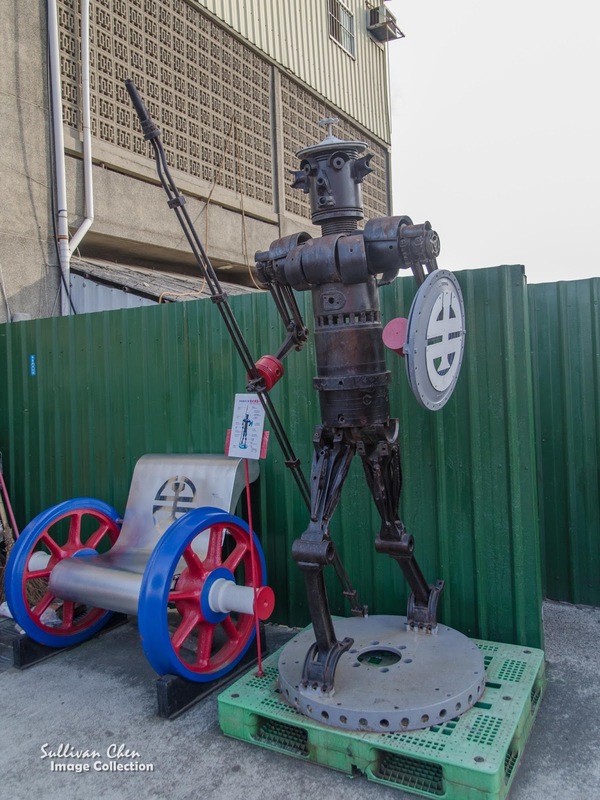 Their components are come from a scrapped diesel locomotive. That's the works of the engineers who take use of material available in their factory. If you observe carefully, there is another pipe at the rear of each locomotive room. The designed was to improve the air circulation in time when there were steam locomotives only. Therefore, there are 24 pipes in total. have been modified for new locomotives. Room No 1 and Room No 2 are 3 floors and its ground floor is half under the ground. Room No 3~No 7 are 2 floors. And there is only one ground floor in Room No 8~12. 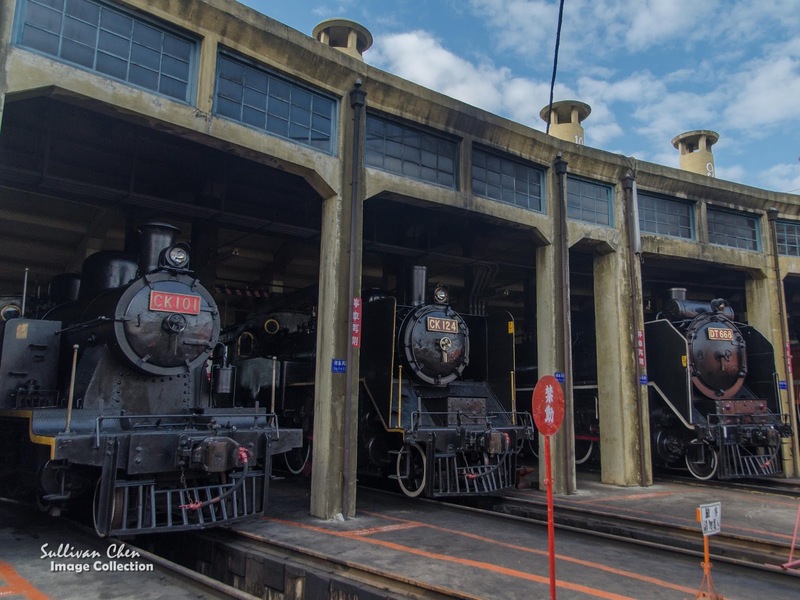 There are 3 steam locomotives in service now in Taiwan and they are parked in Room NO 10~No 12. CK10, CK124 and DT668, the series number of the steam locomotives, are repaired after they had been scrapped for decades. The Fan-Shaped Train Garage opens from 8:00am to 17:00pm, 7 days a week. 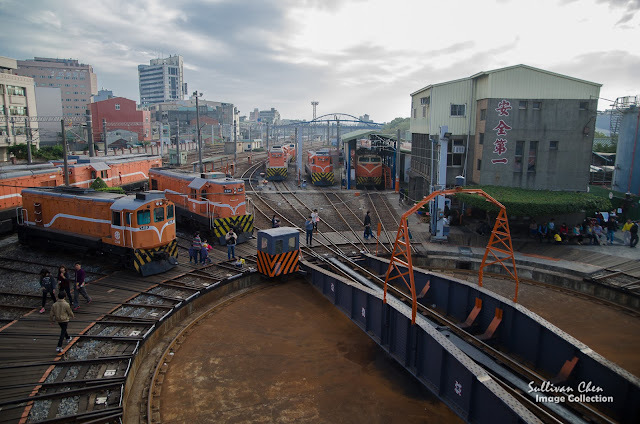 The Fan-Shaped Train Garage is next to Changhua Train Station. It takes about 15 minutes from Changhua Railway Station to the Fan-Shaped Train Garage. Please walk north about 5 minutes and you will find tracks by your left-hand side. Turn left and walk along the track until you find an underpass. The Fan-Shaped Train Garage is located at the other side of the underpass. You can ask for help from the Station staff before visiting.